The marking guide from the American Public Works Association provides for a universal use and understanding of the temporary marking of underground facilities. 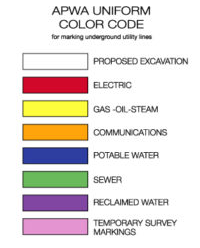 Use of color-coded surface marks (paint, chalk, flags etc) is to indicate the location and route of buried facilities. All marks should indicate the name, initials or logo of the company that owns or operates the lines to help determine the proper facility owner if needed. 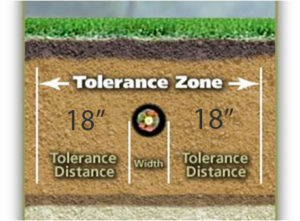 If the width of the facility is greater than 2” (5mm) then it is good to indicate the width. If the surface above the buried facilities is to be removed, such as asphalt removal, then supplemental offset marks may be used. Offset markings should be on a uniform alignment and must clearly indicate the actual facility specific distance. Proposed excavations can be marked with white to show the location or boundaries of the proposed excavation.